This Gordon Ramsay dish uses several different ingredients to create a nice afternoon lunch, bursting with great flavours and texture, especially from the crispy skin of the salmon, the olive-oil infused potatoes and the oven-roasted tomatoes. Since I only have 1 photo to show for it, I compensated with a lot more text in place of the photos. 1. Slit parallel lines halfway deep into the salmon fillet, about 1 finger width apart. Rub in salt and black pepper. Here’s where you can add in the thyme if you desire. Optionally you can use rosemary or basil. Drizzle over with olive oil and rub in gently. 2. Drizzle a non-stick pan with some olive oil and heat it over medium-high heat. Once it just starts to smoke, put in the salmon skin-side down and let it sizzle. At the same time season the salmon side up generously with salt. 3. Let it cook there and don’t touch it. You can monitor it by watching the cross-section of the salmon and seeing the color become paler. When it’s 2/3 cooked, flip over to cook the other side. 4. Once the other side is cooked also, turn it back on the skin side and take it off the heat. 1. Slice the cherry tomatoes into halves, drizzle with olive oil, and lightly sprinkle some salt and black pepper over them. Roast them in the oven for about 10-15 mins at 200°C until they become somewhat shrivelled. 1. Boil the potatoes until they are soft, then transfer to a pot with some olive oil. Turn up to medium heat and crush the potatoes with a wooden spoon. Do not crush them until they become like mashed potatoes in texture. 2. Drizzle some more extra virgin olive oil, parsley, black pepper and a pinch of salt over the crushed potatoes. Churn the crushed potatoes over gently to coat them with the oil and seasonings, letting the heat infuse the flavours into the potatoes. 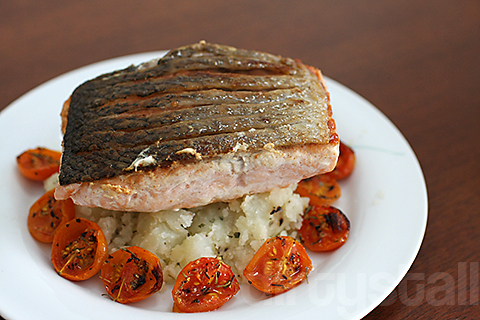 To serve: Scoop a mound of the crushed potatoes, then place the salmon on top of it and garnish around the potatoes with the roasted tomatoes. 6 Responses to "Crispy Pan-fried Salmon"
my mum bought a 4kg salmon fish and i’m sick of grilled salmon, so i’m definitely going to try this recipe out! Finally you wrote the recipe! haha but what so Gordon Ramsay about this? Ever tried poaching salmon in olive oil, salmon confit or salmon sous vide? To me these are the best ways to enjoy salmon (besides sashimi). The doneness comes out beautiful rare, like a non-salty version of smoked salmon, pink with a tender texture. Pan fried salmon is fine. As long as the exterior is wonderfully crisp and insides almost rare. Yours look over done lol. It’s a Gordon Ramsay recipe! Hehehe. I do intend to try poaching salmon next though. Have never tried that method before! Ohhh yeah if you used butter it will definitely boost up the flavours of the salmon. A bit of lemon zest on top might also compliment the taste.